Another resident, James Ferbin, lives with his family in Manhattan Village, and says the new downtown plan will make it easier to come to the beach and to visit shops and restaurants downtown. Local leaders see the bullet train-related infrastructure development as a clear plus. Mayor Mark Burton, posing for a photo with the bullet train's #Iwillride hashtag, lauded the train stop and the associated downtown structure. The project will add about 1,000 new downtown parking spaces in 4 underground levels and in some of the 8 stories above ground. Almost 25,000 square feet of new downtown retail and restaurant space will be part of the towering structure, featuring panoramic ocean views. Mayor Burton said the project will solve many of downtown Manhattan Beach’s current problems, while boldly bringing the city into the 21st century. He also said the plan represents a natural evolution for Manhattan Beach. 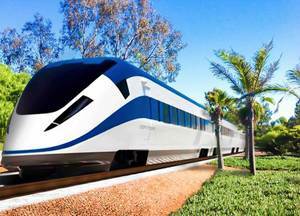 Despite those positive reviews, some mixed emotions greeted the surprise announcement that Manhattan Beach had been selected for a coveted station stop on the revamped California bullet train line. While the city gains parking and retail space, it will lose the treasured “Beach Vons” supermarket and an adjoining Union Bank branch. The parcels were acquired via eminent domain by the California High Speed Rail Authority to house the necessary parking for bullet train users. The project later grew from there to include the retail components on upper levels. Standing in front of the Vons, Percy Jameson, a Tree Section resident, said, “Who even knew there was a bank right there? Wow. That’s prime turf that was being wasted. But yes, I will miss the Vons." Opponents like Wales don’t have much chance of derailing the project, though. A tangled web of federal law, state laws enacted by the original bullet train ballot initiative and local ordinances have all but eliminated residents’ say-so on the plan. The state rail authority now controls the greenbelt, where the new high-speed train will revive the old trains’ right-of-way (now a jogging path), in addition to the downtown plots where the parking and retail structure will be built starting this Fall. The announcement of this major new development comes after rumors had been bubbling up about a “secret chapter” to Manhattan Beach’s new Downtown Specific Plan. Turns out, those rumors were entirely true. In fact, in executive session, City Council has already enacted ordinances pertaining to the Vons/Union Bank location and various traffic-related mitigations around the new parking structure. Homeowners whose properties will be affected will be getting letters from the city today. Marc Sedona has been railing for months on his blog, MB Watchdog, that the pending Downtown Specific Plan should be called the “Downtown Suspicious Plan.” He was the first to raise concerns that the city was up to something that wasn’t being publicly discussed. However, Sedona says he’ll ride the rails.